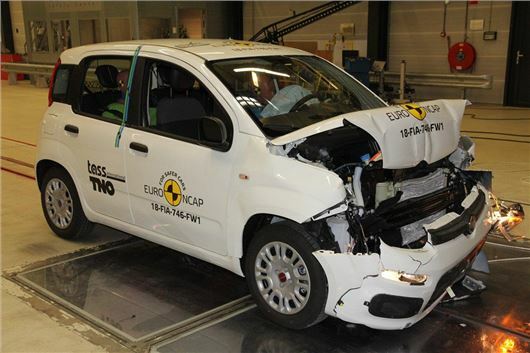 The Fiat Panda has been awarded a zero star rating for safety by Euro NCAP in the latest round of crash tests. The Panda was originally tested when the latest generation first went on sale in 2011, attaining a four star rating. But under the newer more stringent tests, that has dropped to zero. Concerningly, it was awarded just 16 per cent for child occupant protection with the full-width rigid barrier test showing weak protection of the head and neck. It scored 45 per cent for adult occupant safety. The only other car to match a zero star rating in the new tests is another Fiat - the ageing Punto. Meanwhile, industry experts have called the results 'shocking'. "Most troubling is the Fiat Panda is seen as a good choice for young drivers and fledgling families. But the only safety technology fitted were seatbelt reminders and the rear system failed to meet requirements, so wasn’t even rated. These shocking Euro NCAP test results demonstrate an inconsistent commitment to safety," says Matthew Avery, director of research at Thatcham Research. The Jeep Wrangler fared little better, receiving just a one star rating. Considering this is a new model, this will doubtless be far more concerning for Fiat-Chrysler. Adult safety was rated at 50 per cent with, structures in the dashboard thought to present a risk to occupants. In comparison the Kia Sportage has a 90 per cent rating. Fiat says: "We take the safety of customers and road users extremely seriously and the Fiat panda and latest Jeep Wrangler comply with all safety legislation in every county in which they are sold." In other tests, the new Audi Q3, BMW X5, Hyundai Santa Fe, Jaguar I-Pace and Peugeot 508 were all awarded five star ratings along with the Volvo V60 and S60. But even those were not without issues. The crash tests on the Hyundai Santa Fe highlighted an issue where the side curtain airbags of cars equipped with a panoramic roof could be torn during deployment. Hyundai has now changed the airbag fixings in production and early cars are subject to an official recall. So what happens now? Do the Euro NCAP results carry any weight with national health and safety legislation. Fiat say they comply with all safety regulations. Or is this a case of "buyer be aware"
Fewer than 50 % of all new vehicle types are tested including for instance S class Mercedes and XJ Jaguars so I doubt that these tests are any more than arbitary when setting construction standards. Hurling cars into obstructions and rams in a Test centre is very similar to testing MPG in laboratories . The only true standards are those discovered under normal driving conditions . Nearly all 4x4's are not tested at all under Euro N Cap!. With all the information gleaned from actual Accidents by police the insurance industry and vehicle Body work Repairers we can surely do better than these 1960's methods? follow the rules so closely in order to bend them to their advantage at all times. Anyway Mr Dellow man, our family's 1951 Mk 2 was a complete death trap but if you know that you drive accordingly . The real problem lays with Manufacturers and Legislators ; too many Licensed drivers and too few age related re-tests. What happens if you own a new Fiat Panda, do owners of newly registered cars have a legal case against Fiat for providing an unsafe car. I bought a new one for my son only this September. I cannot see how you'd have any sort of case against Fiat. Firstly, it hasn't 'failed' the NCAP test, it has just been rated by their revised standards. As long as it complies with all the statutory requirements for any country in which it is sold, you couldn't reasonably expect to win a case citing the NCAP results. If, in 2011, it gained a rating of 4 stars on the standards by which NCAP assessed any car, and there were many cars which scored lower, I think Fiat can be seen to have made a pretty good job of covering any safety concerns. The fact that NCAP have moved their goalposts will, of course, mean that a number of cars will be re-assessed, and I would be surprised if Fiat don't do something following this test, which I believe has only just taken place. I'm no apologist for Fiat, but I still believe the Panda makes a cracking first car, and will encourage son no. 3 to consider one when he starts learning to drive. We had a mk 2 for many years - see my other post. I do accept this won't be brilliant for resale values, but I would encourage your son to keep it and enjoy it. I think driving any car into a concrete block is likely to be detrimental to your health, and a steel ram driven hard enough is going to make a mess of the sides of any car, I guess these tests just determine whether you'll walk away or not. Speaking personally, we've just got rid of a 2005 mk 2 Panda which we had for 9 years and did 80,000 miles in. Two of my sons learnt to drive in it, and it was bashed, scraped, pranged and generally acquired the scars of having been driven by two new drivers. None of them was ever injured driving it, though they never drove into a concrete block head on. I thought it was a cracking little car - 1.2 petrol - and apart from normal wear items, NEVER let us down. The Panda is bound to fare worse against the current NCAP tests than when it was originally tested.That is no surprise. However even without the new electronic aids to safety the Panda's structure is inferior to newer cars. So whilst FIAT undoubtedly do meet all legislative safety requirements the structure of a car does not come under these requirements. However cars can be lightweight and have good primary structural performance. Just look at Subaru Impreza, XV and Forester; and the Honda Jazz. So come on FIAT up your game. To those who dismiss the NCAP tests there was a study in the USA as to why people were getting killed of badly injured in what should have been survivable crashes. The study showed that if the car suffered an oblique frontal crash (offset0 the full benefits of its front crumple zone were not utilised. So the US equivalent, then NCAP introduced the offset front impact test. Subaru were one of the first to design their cars to meet it and the SJ Forester that i bought in 2014 fared better in NCAP than Volvo, MB, et al. So studies of accidents are fed back into NCAP and are used to further improve safety of new cars. I feel the tests are useful in demonstrating the structural integrity and safety of individual vehicles and as such enable buyers to make informed choices about which car is best suited to their needs. The tests are unlikely to reflect all real life situations where a range of scenarios can occur that will stretch current engineering capability to protect the car's occupants. The tests are also valuable in terms of encouraging manufacturers to continue developing technologies and engineering breakthroughs that will result in increasing safety for drivers and pedestrians alike. I don't think I would consider a car with a low NCAP rating for my daily use which includes transporting older relatives and my grandchildren. But for an occasional use car that will only have me on board I may well take a punt if I loved the car enough. This could well be a classic car or sports car. I tend to agree with the above comments. Apart from the new Panda we bought in September we had an elderly Panda which was excellent and both my children learnt to drive in it. I suppose I was just disappointed to buy a new car and then it gets a zero star. That is the way life is sometimes, I also own classic cars. I doubt any would do well under modern tests. That does not stop me driving them. In the previous NCAP test! This rather sets the 3-star rating given to the new Suzuki Jimny in a different light. The test needs to be more realistic. Drive a 44 tonne lorry in the back of a car at 60 mph, the driver using a phone to text his/her mates. Use a car crosses teh central barrier at 70 mph and hitting something head on , the driver having fallen asleep or gone the wrong way up a motorway. Would people survive these collisions? If not then the cars need redesigning . Can I suggest a Challenger tank would pass the test and gain five stars? What a crazy situation - you buy a new car with an excellent safety rating one day - and then within a week it is bottom of the class - yet the current car is more safe than the one tested as ESP is now standard. It would also be helpful if we could be told how other cars in the same class fare in the new test - the i10, Picanto, Aygo, C1, the UP - how many stars do these get now ? As it stands, the article is far from balanced, and slags off the Fiat without contrasting it to rivals of similar size or price. The Panda is a fine small car, and in most respects is better than it's class rivals. Let's not lose sight of that. For most of my 60 years of driving, Austin A30. A35, Morris 1000, Ford Anglia Escorts and even early Astras, which would probably score negative numbers in crash safety tests, I am still alive and healthy. Safe driving will keep alive and well far more than any safety features fitted to a car. If you don't crash you won't get injured. Cars are so safe now that a few drivers do stupid things when driving. I have never bought a car because of its safety rating, but to do what I need in the most comfortable relaxed way for me.